Source: Tyrrell County Confederate Memorial, Columbia. Image courtesy of the North Carolina Department of Cultural Resources. Photo by Tom Vincent. 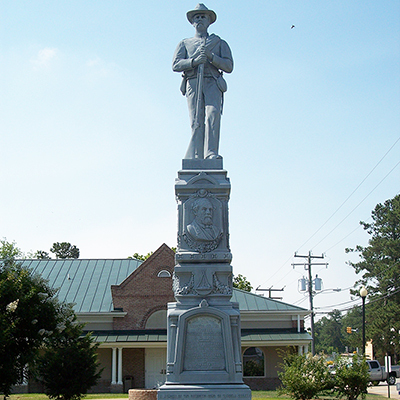 The Tyrrell County Confederate Monument memorializes Civil War soldiers as well as former slaves. The monument stands next to the Tyrrell County Courthouse. General James Johnston Pettigrew, a Tyrrell county native who acted as a Confederate general, is depicted atop the monument facing north. Additionally, a smaller bust of Robert E. Lee is depicted on the monument's north face. North, tablet: THIS MONUMENT / WAS / ERECTED BY THE / TYRRELL / MONUMENT ASSOCIATION, / A.D. 1902. / EXECUTIVE COMMITTEE. / MARK MAJETTE, ABNER ALEXANDER, / THOMAS L. JONES, J. S. CAHOON, / AND C.E. TATEM. / FINANCE COMMITTEE. / MRS. B. V. MCCLEES, MRS. J. C. MEEKINS SR., / MISS LINA B. ALEXANDER. / PRESIDENT. / LT. COL. WILLIAM F. BEASLEY. North, upper base: IN MEMORY OF THE PATRIOTIC SONS OF TYRRELL COUNTY / WHO FELL IN THE SERVICE OF THE CONFEDERATE STATES. North, lower base: GENERAL JAMES JOHNSTON PETTIGREW. / HIS NORTH CAROLINIANS WENT FARTHEST AT / GETTYSBURG, PA.
West, upper tablet: WAR / COMMENCED / AT / FORT SUMTER, / S. C., / APRIL 12, 1861. West, lower tablet: OFFICERS / COMPANY A, / 32ND N. C. TROOPS / J.H. THOMAS, CAPT. / L. L. HASSELL AND F. F. PATRICK, 1ST LTS. / HENRY ARMSTRONG, HOLLOWAY / ARMSTRONG, G. W. BATEMAN, / J. C. DUGUID, 2ND LTS. / ABNER ALEXANDER, 2ND LT. 61ST N. C. TROOPS. / JAMES JARVIS, 2ND LT. 2ND N. C. CAVALRY. / J. W. SIMMONS, 1ST LT. 2ND N. C. CAVALRY. / FIELD OFFICERS OF 32ND N. C. / TROOPS TAKEN FROM CO. A. / E. C. BRABBLE, (CURRITUCK CO.) COLONEL. / D. G. COWAN, (BERTIE CO.) LT. COL. / HENRY G. LEWIS, (TYRRELL CO.) MAJOR. West, upper base: AS A TRIBUTE TO COMRADES WHO HONORABLY / SERVED THE CONFEDERATE CAUSE TO THE END. West, lower base: WILLIAM M. OWENS, CAPT. / CO. G, 2ND N. C. CAVALRY / BRANDY STATION, VA.
South, lower tablet: CONFEDERATES LIVING / IN TYRRELL COUNTY / WHEN THIS / MONUMENT WAS ERECTED: / ABNER ALEXANDER, W. L. GIBSON, / B. V. ALEXANDER, THOMAS L. JONES, / NELSON ALEXANDER, W. C. KEMP, / W. W. ALEXANDER, W. W. KEMP, / W. J. BARNES, W. F. KNOWLES, / THOS. BASNIGHT, JAMES LITCHFIELD, / D. D. BRICKHOUSE, J. P. NICHOLS, / F. L. BRICKHOUSE, JAMES PHELPS, / J. S. CAHOON, JOHN RHODES, / JESSE CAHOON, J. A. SAWYER, / W. R. CARAWAN, 2ND LT. S. L. SAWYER, CO. H, 33RD N. C. TROOPS, W. J. SAWYER, / W. G. COLSTON, EDWARDS SEXTON, / A. A. COMBES, W. E. SHALLINGTON, / J. L. COOPER, B. S. SPENCER, / W. S. DAVENPORT, A. H. TATEM, / M. G. ELLIOTT, C. E. TATEM. South, upper base: TO THE NOBLE WOMEN OF TYRRELL COUNTY, WHOSE / DEVOTION TO OUR CAUSE AND SACRIFICES IN ITS BEHALF, / AND FOR THEIR LOVED ONES IN THE FIELD, ENTITLE / THEM TO RANK WITH THE HEROINES OF ALL AGES. South, lower base: NELSON MCCLEES, 1ST LT. / EDENTON BELL BATTERY / FORT ANDERSON, N. C.
East, upper tablet: WAR / ENDED / AT / APPOMATTOX, / C. H., VA., / APRIL 9, 1865. East, lower tablet: WE LOVINGLY DEDICATE / THIS TABLET / TO / THE MEMORY OF / MARY ALEXANDER / BEASLEY, / WHO WAS BORN IN TYRRELL COUNTY, / A. D. 1811, / AND DIED IN TORONTO, ONTARIO, CANADA, / IN 1892. / SHE WAS THE DAUGHTER OF / HENRY AND CLARKEY ALEXANDER, / AND DEVOTED THE FOUR YEARS OF OUR / WAR TO NURSING OUR SOLDIERS, WHO / LOVED TO CALL HER "MOTHER BEASLEY." / SHE WAS THE MOTHER OF / LT. COLONEL W. F. BEASLEY, / 71ST N. C. TROOPS, WHO WAS THE / YOUNGEST OFFICER OF HIS RANK IN / THE CONFEDERATE ARMY. East, upper base: THE CONFEDERATE SOLDIER WON AND IS ENTITLED TO THE / ADMIRATION OF ALL WHO LOVE HONOR, AND LIBERTY. East, lower base: WILLIAM MORRIS, / SAILOR ON MERRIMAC / HAMPTON ROADS, VA.
Zinc. Also known as “White Bronze” which was a proprietary treatment of cast zinc produced by the Monumental Bronze Company and its subsidiaries. Cast pieces were soldered internally to avoid visible seams. The outer surface was then sandblasted to create a carved-stone appearance. The featured address by T.G. Skinner was said to be a “masterly defense of the cause of the South,” before a crowd estimated at 3,000 people. Colonel W.F. Beasley presented the monument to Tyrell County on behalf of the Monument Association and Mark Majette made the speech of acceptance. Miss Lula Jones, daughter of a Confederate veteran, unveiled the monument. This monument is frequently referenced in debates regarding proposed monuments for African Americans surrounding the Civil War era, as it is one of a small group of monuments which commemorates slaves. The monument is located beside the Tyrrell County Courthouse at the southeast corner of Main Street and Broad Street. The Tyrrell County War Memorial stands on the east side of the courthouse building. The monument stands in a grass area surrounded by a circular walkway and small trees.